I make no secret of the fact I can not draw, but I do love to colour and paint. 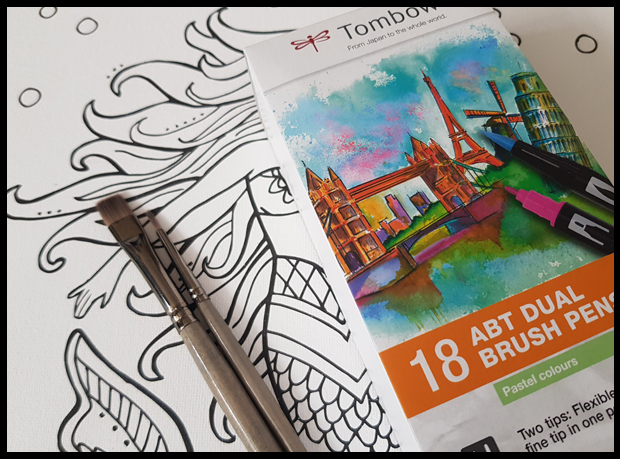 So when I found these brilliant colour-in canvases I was very excited to try out the new Brush Pens from Cass-Art's watercolour range. Cass Art is a UK leading art supplier for all arts & crafts equipment for all ages. Not only with a mission to fill every town with artists but also to take pride in partnering with top UK art brands such as The National Gallery, The Royal Academy of Art, National Galleries Scotland & Sky Arts. 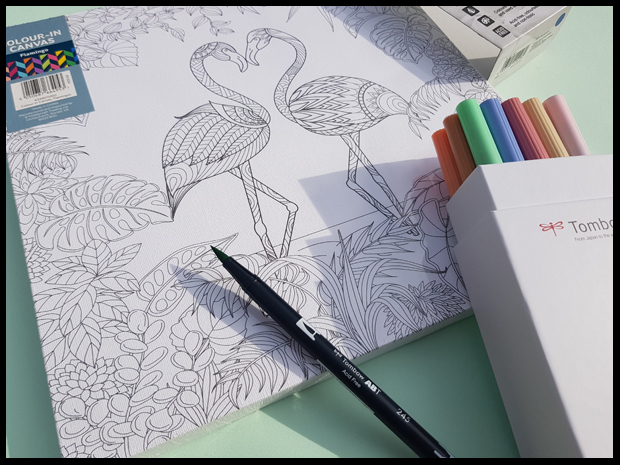 The products I have received and reviewed in the past have been of superb quality, so when asked if I would like to review their watercolour range, I was more than happy to! It doesn't matter if you can draw or paint freehand, it doesn't matter if you colour outside the lines, it's what makes you happy that counts, and if you find it relaxing to colour in then I say go for it. Drawing and colouring in can be very relaxing. 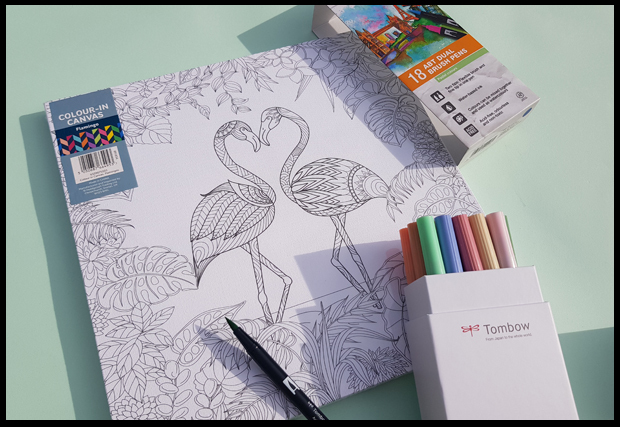 We've all seen the colouring books which are designed for adults as well as children these day; it's obviously a big trend that I hope is here to stay. With that being said, how did I find the Tombow Dual Brush Pens? Very easy and smooth to use. These pens have 2 nips, a brush effect and a thin finer nip at the other. For colouring, I preferred the brush end and didn't really feel a need for the fine end at the lines where all there for me. (I do feel a bit of a cheat). The pastel range does live up to its name and the final image is a fair colouring on the canvas. The pens can be used on various media, and whilst they went on the canvas very well, I'm rather interested in trying these out on the card making stamps that I own also. 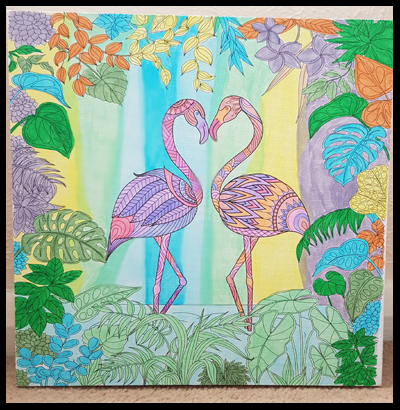 I'm not usually one for showing off my artwork, but for this post I wanted to show you some of the pastel colours, there are 18 in total and whilst I did my best to get all 18 on one canvas, alas, I couldn't quite manage it. 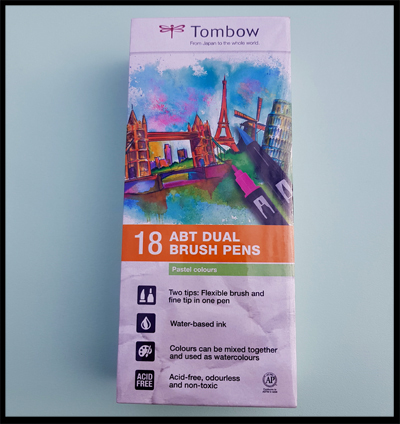 These pens are water-based and odourless and work like watercolour paints and blend effortlessly. The set I used can currently be purchased from Cass-Art website for £49.95. I found these pens to be a real pleasure to use and just lost myself in making the flamingos come to life. Let's see if I can do the same for the mermaid.